The Gauls were Celtic peoples inhabiting Gaul in the Iron Age and the Roman period (roughly from the 5th century BC to the 5th century AD). Their Gaulish language forms the main branch of the Continental Celtic languages. The name Gaul itself may be derived from Latin Galli, or it may be derived from the Germanic word Walha.. 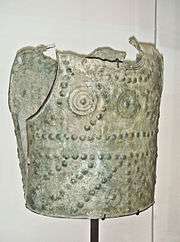 Following the climate deterioration in the late Nordic Bronze Age, Celtic Gaul was invaded in the 5th century BC by tribes later called Gauls originating in the Rhine valley. Gallic invaders settled the Po Valley in the 4th century BC, defeated Roman forces in a battle under Brennus in 390 BC and raided Italy as far as Sicily. The peak of Gaulish expansion was reached in the 3rd century BC, in the wake of their eastward expansion in 281-279 BC, in which the Gauls led by Cerethrius, Brennus and Bolgios invaded Thrace, Macedon and Illyria, sacked Delphi, and killed the Macedonian king Ptolemy Keraunos. The invading Gauls later settled as far afield as Galatia, where they created widespread havoc until checked through the use of war elephants by the Seleucid king Antiochus I in 275 BC, after which they served as mercenaries across the whole Hellenistic Eastern Mediterranean, including Ptolemaic Egypt, where they under Ptolemy II Philadelphus (285-246 BC) attempted to seize control of the kingdom. 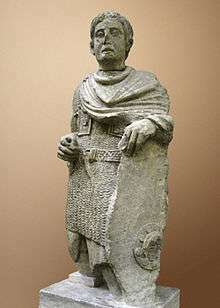 A large number of Gauls served in the armies of Carthage during the Punic Wars, and one of the leading rebel leaders of the Mercenary War, Autaritus, was of Gallic origin. In the Aegean world, an invasion of Eastern Gauls appeared in Thrace, north of Greece, in 281 BC. The Gaulish chieftains Brennus and Acichorius, at the head of a large army, was according to Greek sources only turned back from desecrating the Temple of Apollo at Delphi in Greece at the last minute — he was alarmed, it was said, by portents of thunder and lightning. However, according to the Roman legend of the cursed gold of Delphi, he did sack the city. One king Cerethrius invaded the Thracians, while another Gallic king Bolgios invaded Macedonia and Illyria where he killed the Macedonian king Ptolemy Keraunos. In 278 BC Gaulish settlers in the Balkans were invited by Nicomedes I of Bithynia to help him in a dynastic struggle against his brother. They numbered about 10,000 fighting men and about the same number of women and children, divided into three tribes, Trocmi, Tolistobogii and Tectosages. They were eventually defeated by the Seleucid king Antiochus I (275 BC), in a battle where the Seleucid war elephants shocked the Galatians. While the momentum of the invasion was broken, the Galatians were by no means exterminated and continued to demand tribute from the Hellenistic states of Anatolia to avoid war. 4,000 Galatians were hired as mercenaries by the Ptolemaic Egyptian king Ptolemy II Philadelphus in the 270 BC. According to Pausanias, soon after arrival the Celts plotted “to seize Egypt,” and so Ptolemy marooned them on a deserted island in the Nile River. Galatians also participated at the victorious in 217 BC Battle of Raphia under Ptolemy IV Philopator, and continued to serve as mercenaries for the Ptolemaic Dynasty until its demise in 30 BC. They sided with the renegade Seleucid prince Antiochus Hierax, who reigned in Asia Minor. Hierax tried to defeat king Attalus I of Pergamum (241–197 BC), but instead, the Hellenized cities united under Attalus's banner, and his armies inflicted a severe defeat upon the Galatians at the Battle of the Caecus River in 241 BC. After the defeat, the Galatians continued to be a serious threat to the states of Asia Minor. In fact, they continued to be a threat even after their defeat by Gnaeus Manlius Vulso in the Galatian War (189 BC). Galatia declined and fell at times under Pontic ascendancy. They were finally freed by the Mithridatic Wars, during which they supported Rome. In the settlement of 64 BC, Galatia became a client-state of the Roman empire, the old constitution disappeared, and three chiefs (wrongly styled "tetrarchs") were appointed, one for each tribe. But this arrangement soon gave way before the ambition of one of these tetrarchs, Deiotarus, the contemporary of Cicero and Julius Caesar, who made himself master of the other two tetrarchies and was finally recognized by the Romans as 'king' of Galatia. The Galatian language continued to be spoken in central Anatolia until the 6th century. During the Second Punic War the famous Carthaginian general Hannibal Barca utilized Gallic mercenaries in his famous invasion of Italy. They played a part in some of his most spectacular victories including the battle of Cannae. The Gauls were prosperous enough by the 2nd century that the powerful Greek colony of Massilia had to appeal to the Roman Republic for defense against them. The Romans intervened in southern Gaul in 125 BC, and conquered the area eventually known as Gallia Narbonensis by 121. In 58 BC Julius Caesar launched the Gallic Wars and conquered the whole of Gaul by 51 BC. At this time Caesar noted that the Gauls (Celtae) were one of the three primary peoples in the area at the time, along with the Aquitanians and the Belgae. Caesar's motivation for the invasion seems to have been his need for gold to pay off his debts and for a successful military expedition to boost his political career. The people of Gaul could provide him with both. So much gold was looted from Gaul that after the war the price of gold fell by as much as 20%. While militarily just as strong as the Romans, the internal division between the Gallic tribes guaranteed an easy victory for Caesar, and Vercingetorix's attempt to unite the Gauls against Roman invasion came too late. After the annexation of Gaul a mixed Gallo-Roman culture began to emerge. 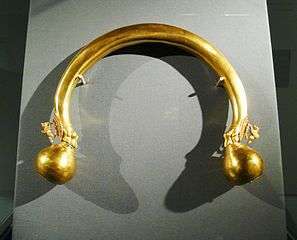 All over Gaul, archeology has uncovered numerous pre-Roman gold mines (at least 200 in the Pyrenees) suggesting that they were very rich also evidenced by large finds of gold coins and artefacts. Also there existed highly developed population centers called oppida by Caesar such as Bibracte, Gergovia, Avaricum, Alesia, Bibrax, Manching and others. 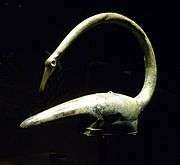 Modern archeology strongly suggests that the countries of Gaul were quite civilized and very wealthy. Most had contact with Roman merchants and some, particularly those that were governed by Republics such as the Aedui, Helvetii and others had enjoyed stable political alliances with Rome. 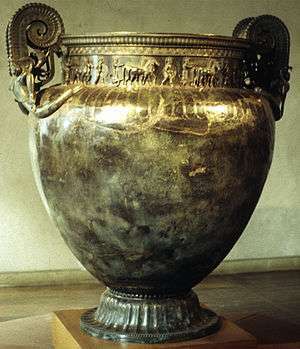 They imported Mediterranean wine on an industrial scale evidenced by large finds of wine vessels in digs all over Gaul the largest and most famous of such vessels being the one discovered in Vix Grave which stands 1.63 m (5'4") in height. Gaulish or Gallic is the name given to the Celtic language that was spoken in Gaul before the Latin of the late Roman Empire became dominant in Roman Gaul. According to Julius Caesar in his Commentaries on the Gallic War, it was one of three languages in Gaul, the others being Aquitanian and Belgic. In Gallia Transalpina, a Roman province by the time of Caesar, Latin was the language spoken since at least the previous century. Gaulish is paraphyletically grouped with Celtiberian, Lepontic, and Galatian as Continental Celtic. The Lepontic language and the Galatian language are sometimes considered to be dialects of Gaulish. Gaulish is a P-Celtic language and (like Lepontic in Cisalpine Gaul) was already spoken in Gaul long before the arrival of the Gallic tribes in the 6th century BC. 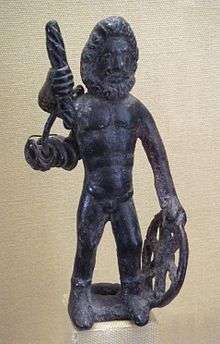 Their system of gods and goddesses was loose, there being certain deities which virtually every Gallic person worshiped, as well as tribal and household gods. Many of the major gods were related to Greek gods; the primary god worshiped at the time of the arrival of Caesar was Teutates, the Gallic equivalent of Mercury. The "father god" in Gallic worship was "Dis Pater". However, there was no real theology , just a set of related and evolving traditions of worship. 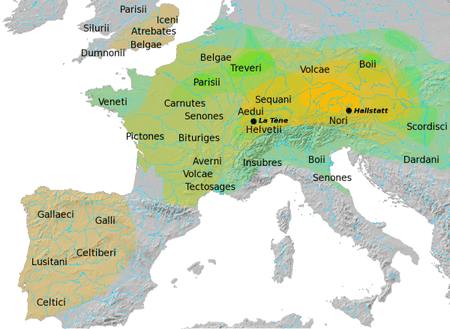 Similarly, in Swiss national historiography of the 19th century, the Gaulish Helvetii were chosen as representing the ancestral Swiss population (compare Helvetia as national allegory), as the Helvetii had settled in both the French and the German-speaking parts of Switzerland, and their Gaulish language set them apart from Latin and German speaking populations in equal measure. 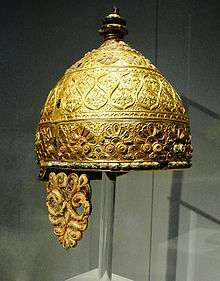 1 2 3 "Gaul (ancient region, Europe)". Encyclopædia Britannica Online. Encyclopædia Britannica, Inc. Retrieved 29 November 2012. 1 2 Hinds, Kathryn (2009). Ancient Celts. Marshall Cavendish. p. 38. ISBN 1-4165-3205-6. ↑ Koch, John T. (2006). "Galatian language". In John T. Koch. Celtic culture: a historical encyclopedia. Volume III: G—L. Santa Barbara, California: ABC-CLIO. p. 788. ISBN 1-85109-440-7. Late classical sources—if they are to be trusted—suggest that it survived at least into the 6th century AD. ↑ "France: The Roman conquest". Encyclopædia Britannica Online. Encyclopædia Britannica. Retrieved April 6, 2015. 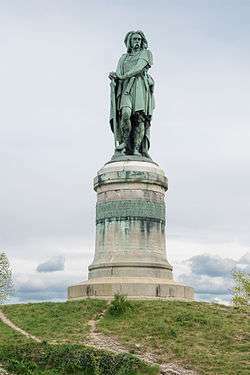 Because of chronic internal rivalries, Gallic resistance was easily broken, though Vercingetorix’s Great Rebellion of 52 bce had notable successes. ↑ "Julius Caesar: The first triumvirate and the conquest of Gaul". Encyclopædia Britannica Online. Encyclopædia Britannica. Retrieved February 15, 2015. Indeed, the Gallic cavalry was probably superior to the Roman, horseman for horseman. Rome’s military superiority lay in its mastery of strategy, tactics, discipline, and military engineering. In Gaul, Rome also had the advantage of being able to deal separately with dozens of relatively small, independent, and uncooperative states. Caesar conquered these piecemeal, and the concerted attempt made by a number of them in 52 bce to shake off the Roman yoke came too late. ↑ Marcellinus, Ammianus (1862). The roman history of Ammianus Marcellinus: during the reigns of the emperors Constantius, Julian, Jovianus, Valentinian, and Valens, Volume 1. H. G. Bohn. p. 80. Retrieved November 2, 2013. ↑ Les Romains qui vinrent s'établir en Gaule étaient en petit nombre. Les Francs n'étaient pas nombreux non plus, Clovis n'en avait que quelques milliers avec lui. Le fond de notre population est donc resté gaulois. Les Gaulois sont nos ancêtres. (cours moyen, p. 26).